These are made from recycled lumber, including a black-painted, red oak-esque, plastic deck material (I think!). Over winter break I created a pattern for the legs (two 2×6’s stacked next to each other) involving a scoop at the bottom and a notch for the apron piece of 1x you can barely see. Teacher-to-Teacher question: How important is sanding in this building process? Sanding is an interesting step in woodworking. Often necessary, fraught with peril, boring as a smooth-actioned brace. I find my students lose interest in the zen-like back-and-forth of hand sanding, I burn-out a child’s ears with the power tools and I create pack-a-day-smokers out of eleven year-olds with the dust. Of course, all this can be mitigated with strong safety practices (which we use) and waiting for a good windy day. But is all that worth it? Will the student learn a skill, a philosophical lesson, a metaphor, a connection with the world by engaging in the act of sanding? I try to engage in as little sanding as possible, to be honest. I have access to several working hand planes. We use those to prep stock for finishing (most stuff then needs a quick rub-down at like 220 or 320 grit for me to consider it ready to be finished). I find the process quicker, more interactive (whole body movement rather than fingers or hands) and finally, safer and cleaner on dust. I have yet to see a student truly gain an appreciation for beauty, or practice their relationship skills or do anything other than make dust while sanding. So I try to avoid it as much as possible. 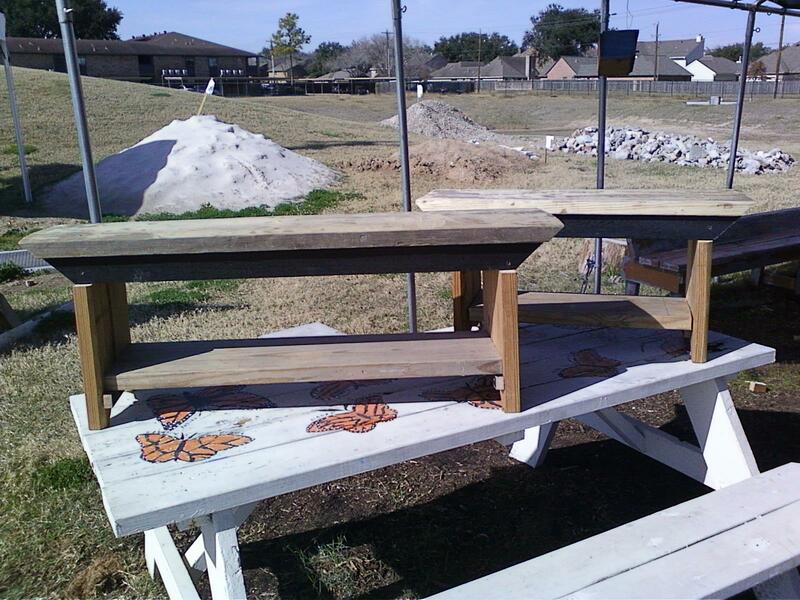 But sometimes the project demands a touch of the sandpaper, like these benches. Then I ask myself: should I do the benches (20-40 min of my weekend) or should the students sand (2-3 days to complete if I’m lucky). They will be painted, not stained or poly-ed, so I will sand to a rough (80-grit or 100-grit) texture and paint with left-over paint. Am I on the wrong tack here? Should I let the students sand?